Guy Hoskie Morenci Turquoise Bracelet size 7 7/8"
We initially made contact with Navajo silversmith Guy Hoskie in December 2005 when we bought some magnificent cluster pendants from him. We have continued to accumulate his work which is always made with fine natural stones. Guy is accomplished in his stampwork and has a good design sense. He is also related to the Reeves Brothers (Sunshine and Gary) and the Cadmans (Darrel, Andy, Donovan & Anderson). This is one among a group of bracelets we commissioned Guy to make for us. We provided a special group of stones culled specially from our stone bank and specified that he make these pieces using 12- gauge Sterling. We wanted him to work with 12-gauge silver so that he could get deep, biting stampwork that is particularly lush with texture. And, of course, we left the artistry to him in choosing how to decorate the cuffs and complement the stones employing his particular sense of aesthetics. This cuff is set with an enormous free-form stone of natural, untreated Morenci turquoise from Arizona cut for us by Bruce Mead. This is quite literally the largest single stone that we've ever had and weighs in at 261 carats. In addition to black chert matrix, this stone also has noticeable deposits of iron pyrite sprinkled throughout the stone. The coloration of the turquoise ranges from soft blue to deeper blue. The stone is thick and is continuous in its quality across its entire expanse. 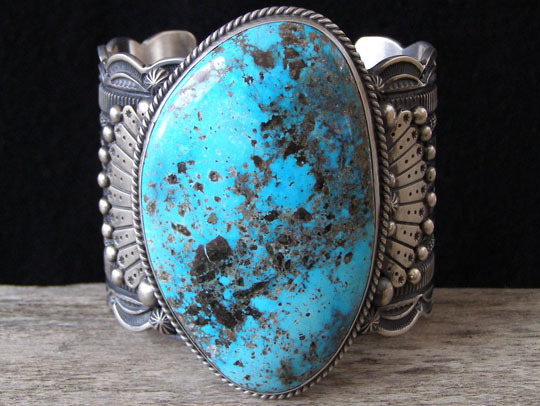 Mined in the sixties or early seventies, this stone came out of the Morenci Mine as "lunchbox" turquoise, meaning that it was found and carried away from the mine at that time by a copper worker who likely "smuggled" it out in his lunchbox. Coupled with the fine smithing evident in the heavy-gauge cuff made by Guy Hoskie, this is a very special one-of-a-kind piece. The stone is framed by appliquées, starred buttons and raindrops. This cuff has gently undulating scalloped edges and Guy's skilled, precise stampwork bites deeply into the heavy 12-gauge Sterling. Do measure your wrist and be aware of your wrist size. This was made with a gap that is proportional to the wrist size it will fit properly. If you have doubts about whether this will fit you, please contact us before ordering. Stone: 3" x 1 7/8"
Width at stone: 3 3/16"
Width of cuff: 2 3/8"
Terminal to terminal: 6 3/8"
Total inside circumference (including gap): 7 7/8"